Unlock: handlebars are disengaged from the front wheel and move independently. Tamper sensor is activated. Unlock: handlebars fold flat for easy bike storage or transport. Tamper sensor turns off after 30 minutes. Lock: handlebars are securely locked to the steering tube and move with the front wheel. Tamper sensor is off. 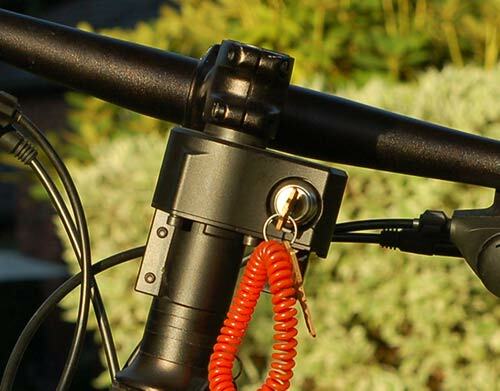 Tampering with the lock (or bike): leaves the handlebars disengaged; tamper alarm transmitted in under 2 seconds. Walking out of range: out of range sensor triggers a phone alarm.